The Jakemans Stadium is the ideal setting to advertise your company. 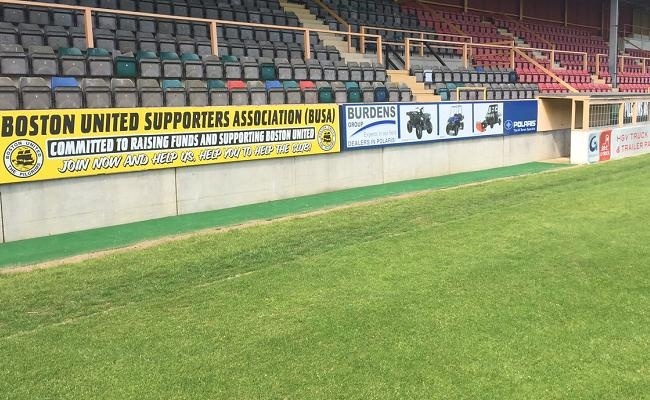 Through our array of pitchside perimeter advertising boards, companies can get their message across. Prices start from £250 plus VAT. All board production costs must be met by the advertiser. 'The Pilgrim' matchday programme is the club’s official 56-page publication. Having won a number of awards over the years, the club programme is popular among supporters and sponsors alike. Prices start from £250 plus VAT — with a range of quarter, half and full page slots available. Advertise your company via posters in the stadium concourses and toilets. Price starts from £100 plus VAT. Please call Craig Singleton on (01205) 364406 for further details on any aspects of the club’s advertising packages.  Pitch Sponsorship The playing surface at The Jakemans Stadium is split into 117 squares for the 2018-2019 season.